← an intermission: 5,331 words later. your greatest trump card is not ability, but availability. Now, let’s return to real life for just one more entry. 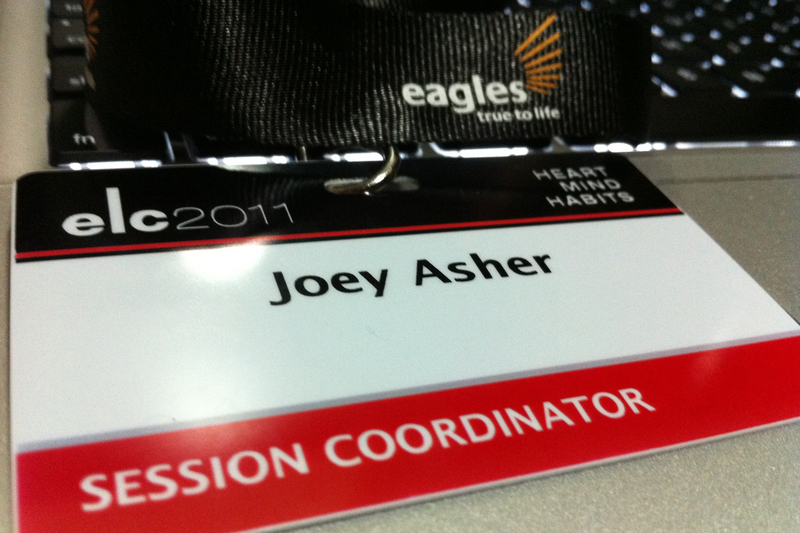 I’d like to capture how I’ve been blessed over the past two days at the Eagles Leadership Conference 2011 (ELC), which took place at the Suntec City Convention Hall. It was my first ELC. It started when I brought Peter Chao out for his (very) belated birthday meal last month. I asked him if he needed help at ELC and he hooked me up to the various departments. I was ready for most assignments, so long as I could handle it. At first, they asked if I could serve as a videographer – I was frank with them and admitted my machinery incompetencies. I think I am more effective as an emcee, usher or with front desk duties. In the end, they assigned me to be a session coordinator (for Workshop 8)… And a narrator (i.e. voice-over) for the ELC 2013 promotion video. Or at least, that was what I thought I was going to do. But when I came down to meet the producer on Wednesday, I found out that I wasn’t just the narrator… I got more than what I bargained for… I discovered that I would be filmed. Yes, f-i-l-m-i-n-g. Not voice-recording. It was a tremendous privilege, but I was a little stunned at their faith in me. So, I took up the challenge, returned home to memorise the script, rehearsed in front of a mirror, and recorded myself with my iPad 2. The actual filming took place on Friday at the Grand Ballroom during lunch hour. It went more smoothly than I had anticipated and I only had a couple of bad takes. The producer was pleased with what he saw at playback and we called it a day. I smiled at the generous favour I received from him. Coincidentally, I was filming in the ballroom that he was going to be speaking at. So at the end of the filming, I saw him stroll in to prepare himself for the session. I asked him if I could serve him in any way possible. He said he was fine and proceeded with his own setup. It was already 1:40pm and I haven’t had lunch so I packed my belongings and got ready to leave the hall for a quick meal. Just before I left, he stopped me. I was ready to skip lunch to perhaps help him with his slides, run an errand for him or just be his PowerPoint clicker. My jaw dropped as I stared at Ps Edmund. I was in the company of giants. Ps Edmund is the Reverend Edmund Chan. 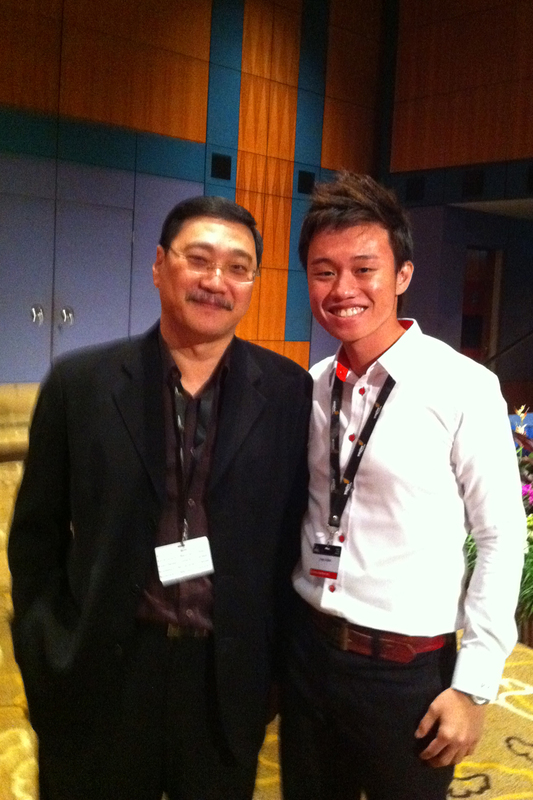 And Edward is the Datuk Edward Ong (do yourself a favour and google him). Joey Asher Tan is the smallest guy on the totem pole. “You want me to what?” I tried to communicate that to him with my eyes. He smiled at me. I had the most stressful lunch, ever, in my entire life. I had absolutely no idea what I was going to say later. Thank God I blogged about our divine appointment – so that really helped to jog my memory. And by God’s grace, within that 15 minutes, I somehow came up with 4 R’s of mentoring (which I chose not to share in the end because I felt it wasn’t necessary). As Datuk Edward was bringing his sharing to an end, my heart was beating faster and faster to no end! I had never been so nervous before! Ps Edmund introduced me (!) and my hands began to tremble uncontrollably after I took the microphone. I uncharacteristically stammered and stuttered at some parts, and none of the eloquence in my arsenal showed itself. It was a humbling, humbling, humbling experience, but I was happy, happy, happy. What an honour. What a privilege. What a moment! It’s never about ability, isn’t it? It’s always about availability. All I wanted to do, was to be available to serve Eagles. And God took care of the rest. Posted on July 23, 2011, in Affirming Faithfulness, Attempted Provocation, Extraordinary Mundane, Leadership Lessons, Mentoring Minutes, Picture Perfect, Quote & Unquote, Simple Pleasures, Spontaneous Conversations, The Greatest Gift and tagged Eagles Communications, Eagles Leadership Conference, Edmund Chan, Edward Ong, Fuller Theological Seminary, Peter Chao, RMIT University, Suntec City Convention Hall. Bookmark the permalink. 1 Comment.